Salt flats, also called salt pans, are large and flat areas of land that were once lake beds. Salt flats are covered with salt and other minerals and they oftentimes look white because of the salt presence. These areas of land generally form in deserts and other arid places where large bodies of water have dried up over thousands of years and the salt and other minerals are the remnants. There are salt flats found around the world but some of the largest examples include the Salar de Uyuni in Bolivia, the Bonneville Salt Flats in the state of Utah and those found in California’s Death Valley National Park. According to the United States’ National Park Service, there are three basic things that are needed for salt flats to form. These are a source of salts, an enclosed drainage basin so the salts do not wash out and an arid climate where evaporation is greater than precipitation so the salts can get left behind when the water dries up (National Park Service). An arid climate is the most important component of salt flat formation. In arid places, rivers with large, meandering stream networks are rare because of a lack of water. As a result, many lakes, if they exist at all, do not have natural outlets such as streams. Enclosed drainage basins are important because they hinder the formation of water outlets. In the western United States, for instance, there is the basin and range region in the states of Nevada and Utah. The topography of these basins consist of deep, flat bowls where the drainage is enclosed because water draining out of the region cannot climb up the mountain ranges surrounding the basins (Alden). Finally, the arid climate comes into play because evaporation must exceed precipitation in the water in the basins for the salt flats to eventually form. In addition to enclosed drainage basins and arid climates, there must also be an actual presence of salt and other minerals in the lakes for salt flats to form. All water bodies contain a variety of dissolved minerals and as lakes dry up through thousands of years of evaporation the minerals become solids and are dropped where the lakes once were. Calcite and gypsum are among some of the minerals found in water but salts, mostly halite, are found in large concentrations in some bodies of water (Alden). It is in places where halite and other salts are found in abundance that salt flats eventually form. Large salt flats are found around the world in places such as the United States, South America, and Africa. The largest salt flat in the world is the Salar de Uyuni, located in the Potosi and Oruro, Bolivia. It covers 4,086 square miles (10,852 sq km) and is located at an elevation of 11,995 feet (3,656 m). The Salar de Uyuni is a part of the Altiplano plateau that formed as the Andes Mountains were uplifted. The plateau is home to many lakes and the salt flats formed after several prehistoric lakes evaporated over thousands of years. Scientists believe that the area was an extremely large lake called Lake Minchin around 30,000 to 42,000 years ago (Wikipedia.org). As Lake Minchin began to dry up due to a lack of precipitation and no outlet (the region is surrounded by the Andes Mountains) it became a series of smaller lakes and dry areas. Eventually, the Poopó and Uru Uru lakes and the Salar de Uyuni and Salar de Coipasa salt flats were all that remained. The Salar de Uyuni is significant not only because of its very large size but also because it is a large breeding ground for pink flamingoes, it serves as a transportation route across the Altiplano and it is a rich area for the mining of valuable minerals such as sodium, potassium, lithium and magnesium. The Bonneville Salt Flats are located in the U.S. state of Utah between the border with Nevada and the Great Salt Lake. They cover about 45 square miles (116.5 sq km) and are managed by the United States Bureau of Land Management as an Area of Critical Environmental Concern and a Special Recreation Management Area (Bureau of Land Management). They are part of the United States’ Basin and Range system. The Bonneville Salt Flats are a remnant of the very large Lake Bonneville that existed in the area about 17,000 years ago. At its peak, the lake was 1,000 feet (304 m) deep. According to the Bureau of Land Management, evidence for the lake’s depth can be seen on the surrounding Silver Island Mountains. 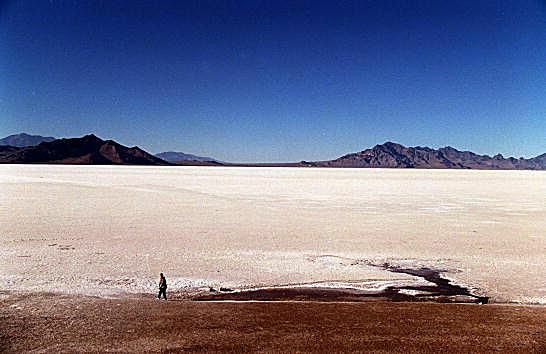 The salt flats began to form as precipitation decreased with a changing climate and the water in Lake Bonneville began to evaporate and recede. As the water evaporated, minerals such as potash and halite were deposited on the remaining soils. Eventually, these minerals built up and were compacted to form a hard, flat, and salty surface. Today the Bonneville Salt Flats are about 5 feet (1.5 m) thick at their center and just are just a few inches thick at the edges. The Bonneville Salt Flats are about 90% salt and consists of about 147 million tons of salt (Bureau of Land Management). The Badwater Basin salt flats located in California’s Death Valley National Park cover about 200 square miles (518 sq km). It is believed that the salt flats are the remnants of the ancient Lake Manly that filled Death Valley about 10,000 to 11,000 years ago as well as more active weather processes today. The main sources of Badwater Basin’s salt are what was evaporated from that lake but also from Death Valley’s nearly 9,000-square mile (23,310 sq km) drainage system that extends to the peaks surrounding the basin (National Park Service). During the wet season precipitation falls on these mountains and then runs off into the very low elevation Death Valley (Badwater Basin is, in fact, the lowest point in North America at -282 feet (-86 m)). In wet years, temporary lakes form and during the very hot, dry summers this water evaporates and minerals such as sodium chloride are left behind. After thousands of years, a salt crust has formed, creating salt flats. Because of the large presence of salts and other minerals, salt flats are often places that are mined for their resources. In addition, there are many other human activities and development that have taken place on them because of their very large, flat nature. The Bonneville Salt Flats, for example, are home to land speed records, while the Salar de Uyuni is an ideal place for calibrating satellites. 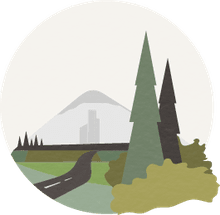 Their flat nature also makes them good travel routes and Interstate 80 runs through a portion of the Bonneville Salt Flats. What Can Pluvial Lakes Show Us About Changing Climates?